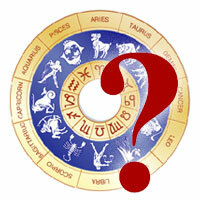 Confuction of Saturn and Rahu such horoscope become (Shrapits). If there is confluence of Saturn and Rahu or if Rahu is in the sight of Satrun then such horoscope becomes Cursed (Shrapit). Because of the past birth's (Shrapit Yoga). Even though there are many good yogas in the horoscope good results are not obtained in this present birth. Though horoscope tallies even then in many cases divorce, being widow or widower Yogas are found. The other reason of it is that the relations between Saturn and Rahu is not taken into consideration and as general practice, Muliplies, Mars, Nadi and the moon are tallied and the marriages are fixed and as such sometime evil results are found. Therefore confluence of the Saturn and the Rahu or the relations of the Saturn and Rahu is necessary to take into consideration. According to my findings in Astrology most of the horoscope which has a confluence of Saturn and Rahu or Confuction of Rahu and Saturn the person who has this. It is seen that one of the members of his family has died of soul degenerated. And because of that a coconut is established. Every year performing house wife's rites or doing religious ceremony even then this occurs. A person from Rajpipla came to me some times ago one of his family members died premature and has become Ghost. At present nobody can sleep in the room near the stair case. This Ghost harasses. This gentleman has done many remedies but even then his did not get success. Get done 'Narayan Bali' but there is no recovery in the situation. A theft event occurred in the person's house and the blame came on to his son Naresh and also it was seen that one person is found mentally unsteady. One of his brother left home and had gone some where and the as yet where about in not known. Lastly on the next day of coconut day his one son because of slight mental disorder left home and went away. They went to inquire about the sone. After a month Mr. Mehta from Dakor come with the horoscope of a lost boy. Whether the lost boy is found or not, that I don't know. Because I tole Mr. Mehta to bring a piece of clothes that he has taken issue and things to be used for vership. Then after we have not met. What i mean to say is that because of Rahu and Saturn cursed Yoga' (Shrapit Yoga). Mental instability occurs. Sometimes a person leaves homes or goes to the other world such come early in the effect of subduiry. The other incident of evil spirit is from hereby of Kothi Falia. In that case one (female) lady died accidently and after that she became evil spririt and all members of the family has been troubled and bothered. Though coconut wad established and proper rites were not performed. Many evil events happende at Mr. Girbatsingh. He was is tussel with his wife which resulted is divorce. His sister went away some where whose where about is not known. In the horoscope of the man the Saturn and the Rahu confluence was found. If prevention is not done in the case of the Rahu and the saturn's shrpit Yoga then such Youga comes hereditary. For that I give here a horoscope of Mrs. Shantaben of patli from petlad Taluka. The Shrapit Yoga (Cursed Youga) has come along hereditary. 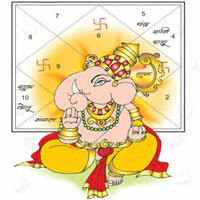 In the horoscope of the lady (Mrs. Shantaben) in the 8th house there is a confluence of the saturn and the Rahu. Hence Sharapit Yoga (cursed effect) occured. In the fifth-house the Mars, the Jupiter and the Merecury is there. Two sons and a daughter, three issues, but because of the shrapit Yoga (cursed effect) the same shrapit Yoga has carried on is her issues (sons and Daughter) whose great effect resulted in his issues. A son Girish patel. A daughter Bharti patel, Many obstruction came in there study. The sone is married but, because of the Sharapit Yoga (cursed-effect) the situation has reached to the divorce whereas the daughter is still unmarried. You can observe that thought there is no chance of divorce (partition in the marriage) even then his wife is at her fathers place for three year and the procedure for divorce is going on. 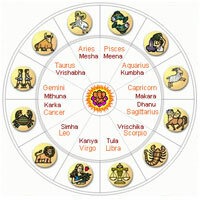 In this two horoscope the shrapit Yoga is became cause observe the sight of the saturn is on the Rahu. Over and above the eleventh house for venus is not good. Seventh ascendant venus is in the sight of the eleventh. This Yoga is also to my Astrologer friend. This gentleman did not marry again after the divorce. In the horoscope of the gentleman there is a "Shrapit Yoga" marriage was fixed by tallying the mars, Even then when the saturn was In "Vrukshika" Rasi the divorce took place. After that, second marriage was not possible. One lady's marriage was settled after tallying the Mars but her husband died in accident. The court case is going on for the Insurance amount, Bank balance salary and graduaty. This is all under obligation of the "Shrapit Yoga" of the Saturn and Rahu. Due to "SHRAPIT YOGA" there arises obstruction to get. Because of the Saturn-Rahu's relation obstacle come in getting issues. Some times at the old age the happiness of the issue is santched. Some times got no issue or in come cased only female issues are there. For this we will see other instances. Shri pareshbhai Modi who reside in surat opp. L.B. Talkies on Bhater Road has only female issues. He come to me with my friend Shri Rameshbhai Contractor. After holding "Santan prapty Yantra" he got a son. 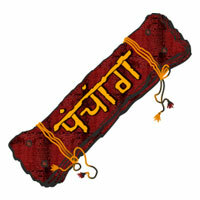 There is "Shrapit Yoga" in the horoscope if your hold yantra, There is certainly a gain. For that the incident or Mr. Pareshbhai Modi of Surat is there. Even Yoga has certainly a remodey but there are very few who know the real remedy. I have read many articules of-Astrologer friends. But every article is seen with negative approach. In every articleitis mentioned that if such yoga is there the result is bed. One Astrologer friend has written in his article that if there is the Moon in the 8th house then theres is premature death, water accident may occure but nobady has shown remedy for it. I have read in one article that if there is Rahu in the Fifth (5th) house and if has a relation with the sun suich girl does nor come in Meanses but what is the remedy of this? nobody has shown. My friends when there Saturn-Rahu relation and for this "Shrapit Yoga" there is a remedy can be done. 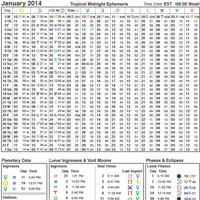 This is my own Rechearch on Astrology. I have gote doctroiet on "Shrapit-Yoga". On 8th day of the Krishna paska (second half) of any month which is called (Kalashtami) get prepare the below shown "YANTRA" and after getting cerimonious installatin this Yantra. Praperation of Yantra with holly mantrochar from 8th to 14th of second half of the month thatn, after on fulmonday (sud 15th). In the this Yantra should be kept in the new pitcher with this Yantra, the root of red chanothi (which to get before hand) Manjith, Kasku, (small cond) comphor piece, vach, four iron nails, tagur, a bottle of red power, abottle of sent, four red bangles and piece of cloth from the clothers the person forwhim this experement in to be doen all you have to keep in the pitcher. Keep a lid on it, and cover it. This pitcher is to be established on a wooden square table cover the table with black cloth, on the cloth put 500 gram wheat and thenput the pitcher on it. After that start worshiping with lighting lamp and incense stick and offering flower, bbil, Gulal on the pitcher. Pitcher, prepare somesweet dish for 'PRASAD' on friday. This PRASAD should be take by only family members. To prepars this 'Yantra' use Gorochan Ashwagandha, Ashta gandha, Majaly, Bhojpatra, Kesar (Saffron) rose water. 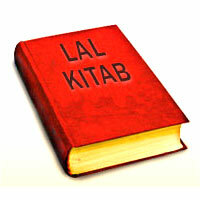 (Lajwanti, Yantra must be prepared from the acquainted person. At the time of installation of this pitcher complete chadity is necessary. This installation must be kept from Fulnoonday (Snd 15th). 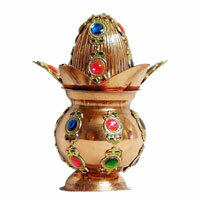 Every evening worship the pitcher with lighting of lamp and incease stick, flowers and etc. On the 14th evening after worshiping fully gather all the tings alongwith the pitcher in the black coth tie it and then go out of the city or village make a circle with milk and water miled liquid and keep the pitcher in it. The mas who is to got to keep this pitcher installation should be of sound will, be should not get afraid of anything when a persons goes to keep this be should not see backward till the cross road, not to wait anywhere, not to talk with anybody on the way after cross road you can go by any vehicle. After send off of the picher return home and before enter the house take bath and then entering the house. "Yantra for Remedy from Shrapit Yoga"
This yantra is shown in "Rahu- eke Adhyan" my famous book. During installation to send off period recite one laks and twenty five thousand Mantras" Maha Mrutyanjay" personally or through learned Brahmin at home. The persons for whom this experiment is to be performed is cut in foreign country or for away even then the remedy procedure can on his behalf other person can perform. But the four inch peice of cloth of the person for whom this is to be performed must get from his usually wear clothes. With that cloth cover the pitcher. This remady expriment for four members of the same family, those are affected by this shrapit Yoga can be done, simaltenously, but pieces of cloth should be seperate. Sharapit Yoga remedy Yantra is my own research and I have performed thousand experiments in which evil effect is removed and good result have certainly been arrived. Nobody has done this evil effect remedy Yantra and proess before except my self fna inno astrology or Tantrik book this is seen. A person wishes to get done this process should personally or by post contract me and get the guidance at A/8 Chintal Park Bld. Vallabhnagar, Pij Road, Nadiad (Gujarat) Phone No. 56015 details will sate from" Rahu Eak Adhayan" my Book. 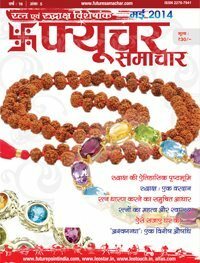 This Book wil gate from Nadiad only.